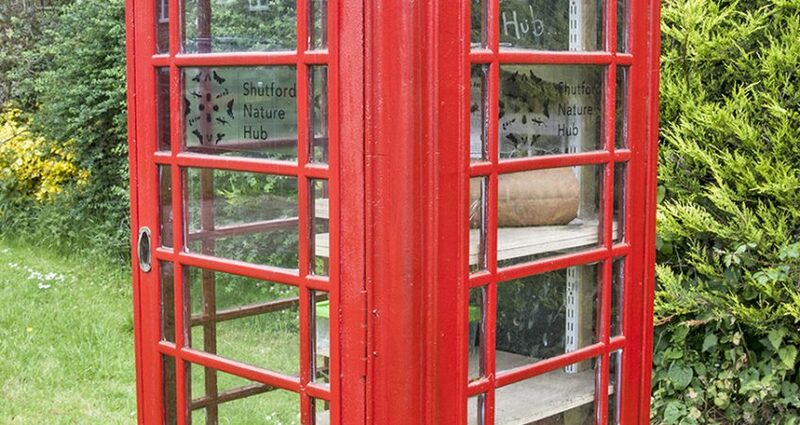 We were asked recently to create a ‘Nature Hub’ in a disused phone box in a North Oxfordshire village. This presented an opportunity to continue our work in support of Professor Dave Goulson and his team and to help promote The Buzz Club. 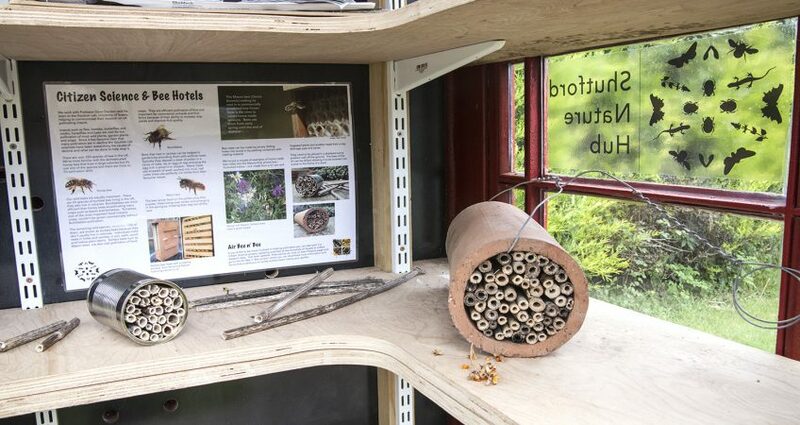 We installed a couple of home made bee hotels and and this Air Bee n’ Bee information poster. Insects such as flies, beetles, butterflies and moths, hoverflies and bees are vital for the pollination of most wild plants, garden plants and crops. Since it has become clear that many pollinators are in decline the Goulson Lab scientists have been researching the causes of decline and what can be done to help stop it. There are over 250 species of bee in the UK. 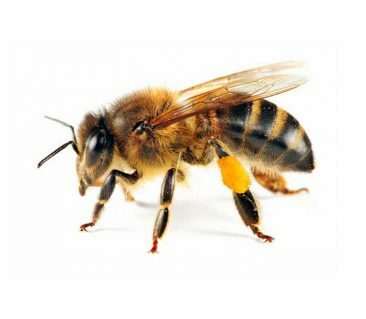 Most familiar are the domesticated honey bee that lives in large colonies but it’s just one of the species and there are limits to it’s pollination skills. Our wild bees are equally important. 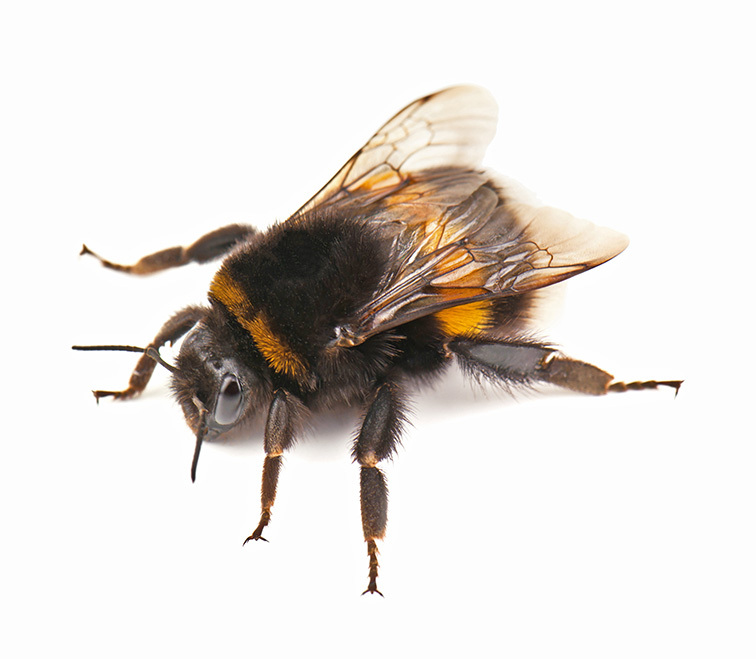 There are 24 species of bumble bee living in the UK, they also live in colonies. (25 if you count recently reintroduced Short-haired bumblebee). Bumblebees are more efficient than honey bees at pollinating many crops such as beans and tomatoes. Tomatoes, one of the most important food industry crops, couldn’t be grown commercially without Bumblebee pollination. The majority of UK wild species, more than 220 of them, are known as solitary bees because they don’t usually live in colonies. 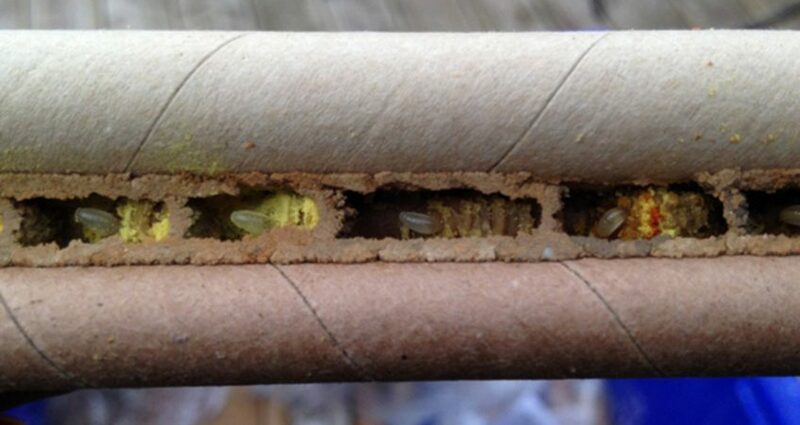 Individuals make nests in holes and cavities, in soil, walls, wood and hollow plant stems. 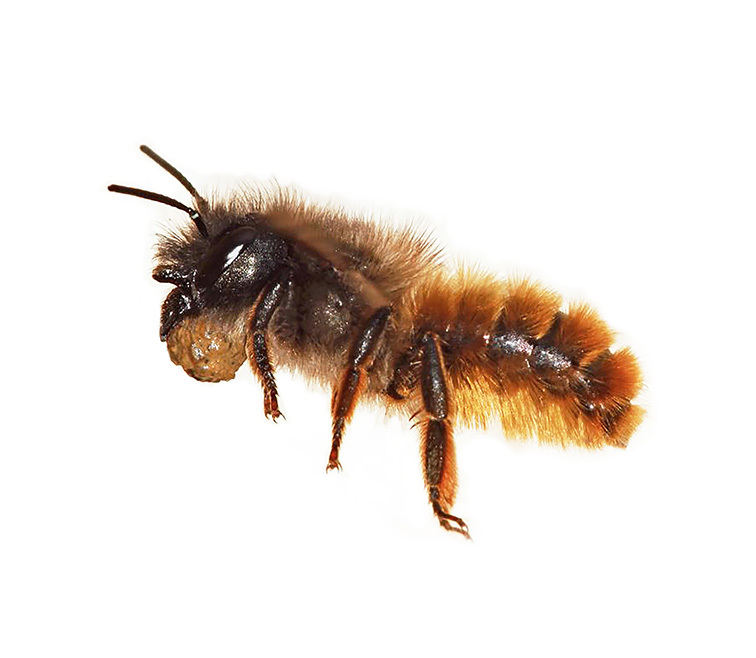 Solitary bees such as Mason bees, are also vital pollinators of food crops. They are efficient pollinators of fruit and important for commercial orchards and fruit farms because of their ability to increase crop yields and improve fruit quality. 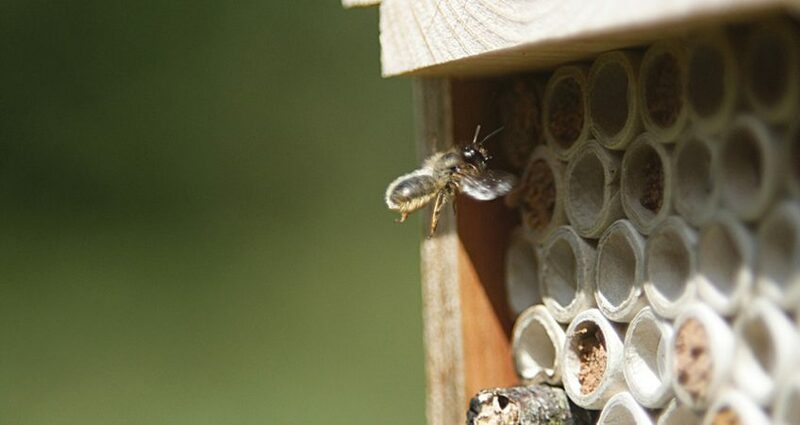 Bees that nest in cavities can be helped in gardens by providing them with artificial nests. Typically they deposit a stash of pollen in a cavity or tube, lay an egg on top and plug the egg with a protective stopper. Mason bees use stoppers of earth worked into mud, leaf cutter bees use perfectly cut circles from their favourite leaves. 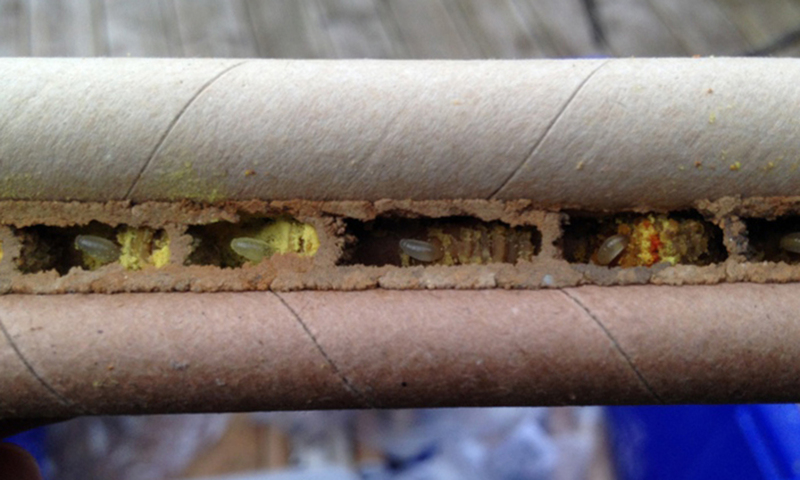 The bee larvae feed on the pollen plug then pupate, hibernating over winter and emerging in the spring by chewing their way out of the nest. 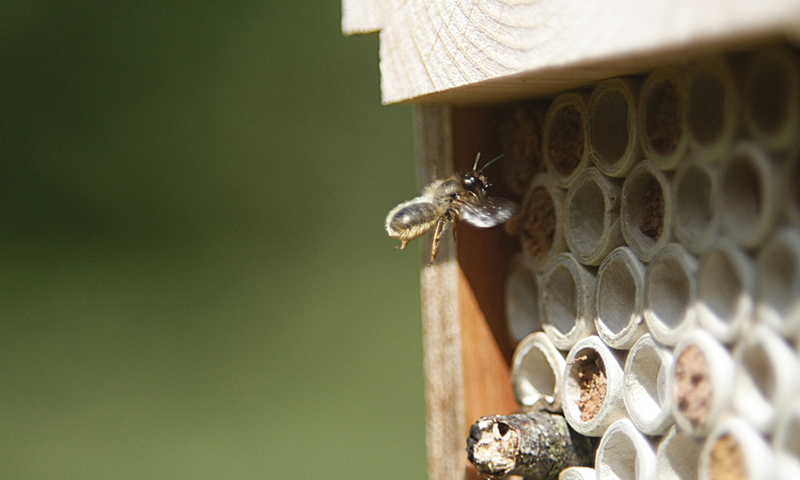 Bee nests can be made by simply drilling holes into wood or by packing containers with nesting material. 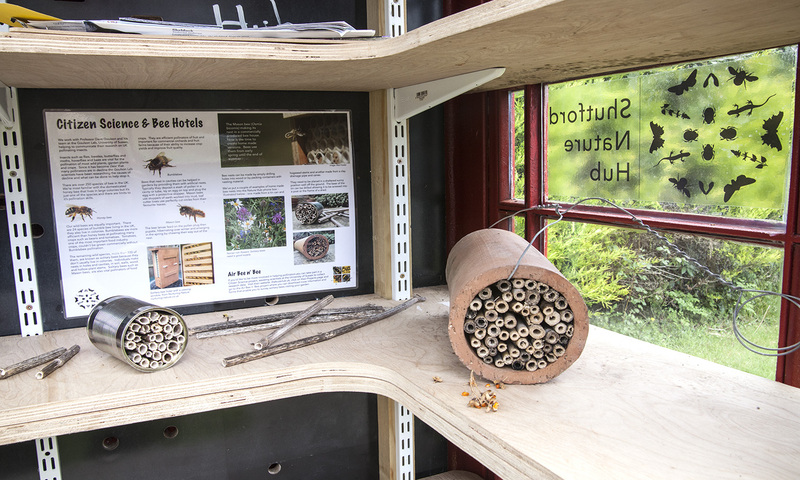 We’ve put a couple of examples of home made bee nests into the Nature Hub phone box – illustrated above – one made from a tin can and hogweed stems and another made from a clay drainage pipe and canes. They need to be placed in a sheltered sunny position well off the ground. 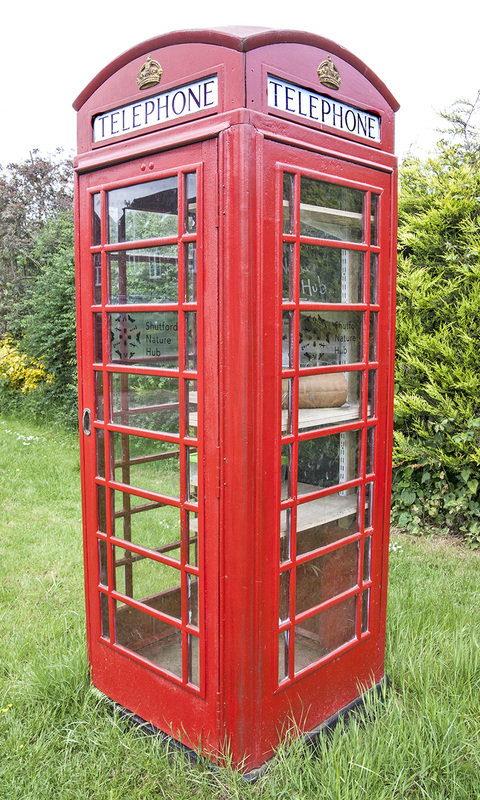 The base of the tin can be drilled allowing it to be screwed into a post or the frame of a shed. 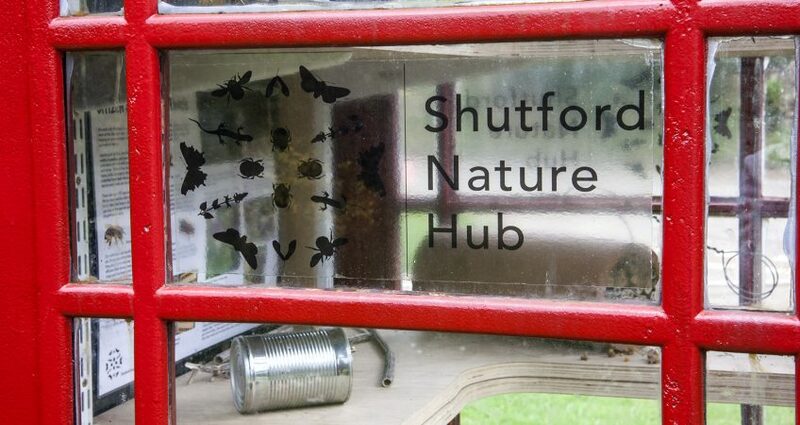 View this short video on how you can help solitary bees with Dave Goulson’s pioneering Tin Can Bee Hotel! 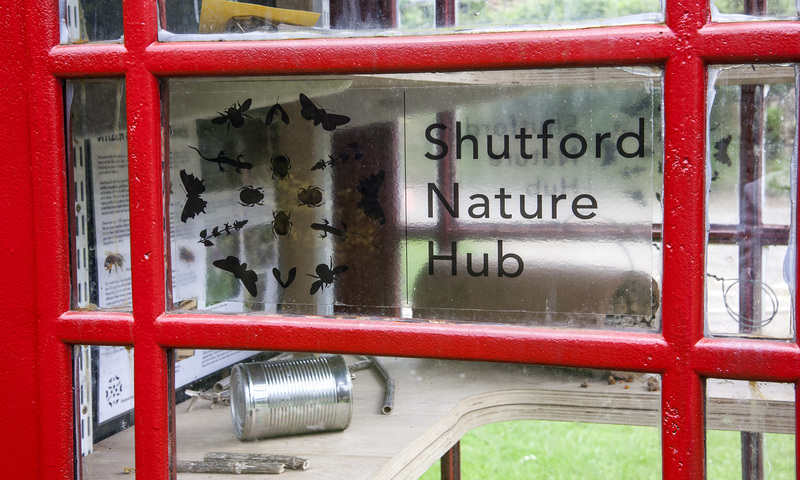 – as well as an extremely cool observation nest box made by environmental educational and research organisation Nurturing Nature.